When it comes to the pinnacle of performance, even the smallest of details can be the difference between total success and total failure. The Hornady 168gr .308 Superformance Match is one of the most carefully crafted, sub minute of angle rounds to ever be produced today. Featuring Hornady’s Superformance engineering, this has become the new standard in which in extreme range ammunition will now be judged. 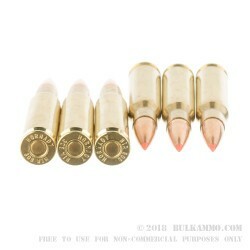 Higher chamber pressures result in an average bullet velocity 200 feet per second faster over standard high performance ammunition, and at a velocity of 2,840 feet per second, this is one of the hottest rounds to be ever be chambered in .308. 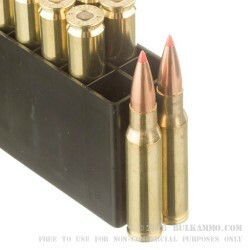 At a muzzle velocity nearly triple the speed of sound, certan polymer bullet tips can began to overheat and actually begin to partially melt in flight. Using Hornady’s signature Heat Shield polymers tip you can be confident of your bullets flight path regardless of the temperature. At a truly bone crushing muzzle energy of 3,008 foot lbs of force, you can be confident that this is one of the hardest hitting .308 rounds on the market. 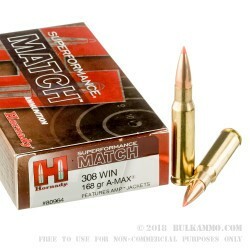 The Hornady 168gr .308 Superformance Match is truly the hotrod of high performance ammunition, and is guaranteed to take your level of performance to the next level.